One of my favourite Ray Daley era episodes of Minder. I always like it when Arthur's juggling multiple business deals in a Minder episode, and this was a great way of incorporating the various deals in the episode. It always cracks me up when Arthur looks calmly at a distraught Ray and says, 'I forgot to mention, the lock-up's on fire'. It's always interesting to see old faces from previous eps popping up in the three Ray Daley series of Minder, and Linal Haft as Mervyn is no exception. The often mentioned, but never seen Pizza Man is also great, and I think they were joking about the Pizza Connection. Other highlights are when Ray's mates bound into the lock-up with the classic stocking masks after Mervyn's heavies steal the bikes, Dave revealing to Ray that Arthur pawned some of Her Indoors' crown jewels to pay for the bikes in the first place, and the fire at the lock-up. I agree, there is a lot going on in this one. Merv is a nasty one minute but Arthur soon gets him back, where it hurts - despite the show of muscle earlier on in the episode. I like it. I gave this a watch this afternoon, I have about 6 episodes to review on series 9, but I'll start with this one on series 10 first. Another good RD episode for me, lots going on and events conspiring to bring down our Arthur, so much so he has even had to hock er indoors precious jewels. I thought GC was superb in this episode, even more so than usual. 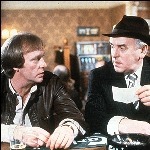 Minder is at its best when Arthur is up against it. Loved the 'robbery' scene at the lock up, classic Minder. The actor Paul Reynolds, who played Gino, he seemed destined for big things back in the 90s, but just seemed to fall off the radar. Overall, an excellent start to the last ever series and apologies to the Terry McCann years aficionados, but Ray Daley episodes really do stand up against the Terry ones. I just watched this for the first time and it is now one of my favorite episodes of Minder. It's great that after all the years and episodes the magic was still there. Two of my favorite moments of George Cole brilliance are in this episode. The first is the way Arthur smiles at the end of part one and the second is the off hand way Arthur tells Rsy the lockup is on fire. A flat out great episode. Minder is especially fun when Arthur is trying to juggle several dodgy deals all at once. He definetly seems to have at least one ball too many in the air this time and everybody seems to have it in for him. Fortunetly everyone else is playing chess while Arthur is playing poker and he has at least one ace up his sleeve. Never tire watching this one.Love the episode title by itself.100th episode is one of the best. I like the fact we here about but don't see The Pizzaman however we learn that he is someone who is dangerous to deal with, but when Ray explains to him that the reason Arthur was late delivering the bikes due to being done over himself The Pizzaman takes pity and presumably gives Mervyn's men a beating and sends Ray and Arthur a free pizza. It's a strange request from Ray to 'bung a fried egg on it as well' I've never seen or heard of anyone having a fried egg on a pizza has anyone else come across this strange culinary choice before? Mind you I wouldn't be surprised if Iceland started stocking fried egg pizzas to go along with their doner kebab pizza and butternut squash with beetroot ones (I kid you not, I've tried the later and their not bad). It has a name the Pizza with the egg on it, I'm sure this is a specialty in some part of Italy, might be Naples. The wife has this when she goes to a local Italian place for food. That's right daz, I have seen "pizza with an egg on top of it" in different parts of mainland Europe over the years too and you'll find pics of this on the interweb too. I thought the episode had a nice mix, going from one place to another. The ending was great. They made the fire chief give out the kind of news Arthur Daley wanted to hear. Cracking episode this. You just knew that the thugs that Mervyn had sent in to do over the lockup would get confused for Marty and Gino! All turned out well in the end for Arthur though. I liked the line by the first insurance salesman who came to look over the lockup. "Mr Daley, I wouldn't insure you if you had the archangel Gabriel himself looking over your premises!!" I love this episode too. There is a lot gong on and some interesting locations. Linal Haft always seems to play a crook - maybe he is evil looking!